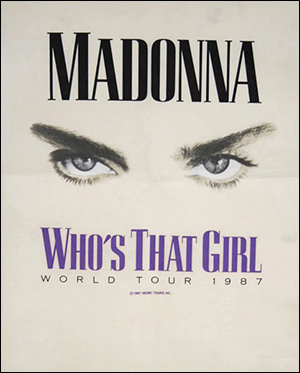 The Who's That Girl Tour was Madonna's first world tour, visiting Asia, North America and Europe. In the summer of 1987, she performed 38 shows in 8 different countries. Most shows were in large stadiums. Her show in Parc de Sceaux, Paris was attended by 131,000 fans, which still stands as a record. The tour was named after the movie Who's That Girl, which starred Madonna in the leading role, and the accompanying soundtrack. It also pomoted her True Blue album, which had been released a year earlier. Patrick Leonard returned as part of her band. For the first time, Donna and Niki performed backing vocals. And also Madonna's brothers Christopher and Mario were part of her tour crew. The Tokyo show was filmed and released on VHS and Laserdisc, but only in Japan. Given its commercial success, it was decided to make another recording to release on other markets. 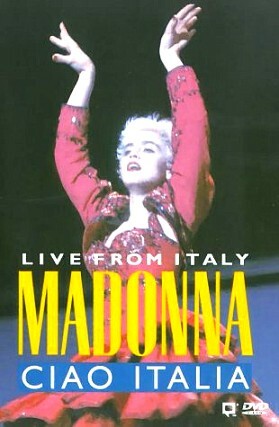 The final tour stops in Turin and Florence were filmed by director Egbert van Hees and released as VHS video album on May 24, 1988, titled 'Ciao Italia: Live from Italy '. In 1999, it was re-released in DVD format. The original release claimed the #1 spot of Billboard's Top Music Video chart for 8 weeks. The RIAA certified it Platinum for the shipment of 100,000 copies.